American Red Cross emergency response vehicles traveled 2.5 million miles to deliver food, relief supplies and other support to communities affected by disasters during 2017. 2017 was a banner year for American Red Cross mission fulfillment. 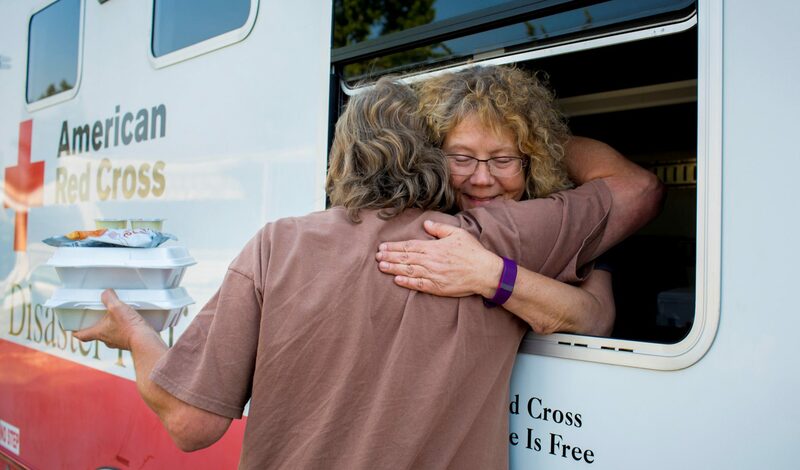 Following multiple major disasters ranging from hurricanes and wildfires to tragic mass shootings, Red Cross workers helped people in need, providing more food, relief supplies and shelter stays than all of the last four years combined. The American Red Cross Minnesota Region had a vital role supporting relief efforts around the nation. Responders — more than 90 percent volunteers — deployed to Texas, Florida, Puerto Rico, US Virgin Islands, California, and other locations. For example, our region supported 328 deployments, including 109 for the Hurricane Harvey relief efforts alone. Locally, Red Cross responders helped 952 people affected by 326 home fires. Minnesota Red Cross volunteer Diane Dunder hands out meals in, Santa Rosa, California, during the wildfire relief effort, October 2017. Photo by Marko Kokic for the American Red Cross. This year people were faced with major disasters and our region was there with deployments to disasters, working at home to support deployments, or providing direct relief to people impacted by disasters at home. We are honored to serve alongside those from our region who provide humanitarian relief during times of great need. We are humbled by the dedication people have for the Red Cross mission to alleviate human suffering in the face of emergencies. To see more local thanks, click here.